I just finished binding my first completed quilt ever. It is hand-pieced, hand-quilted, and 42 inches square. I used 8-inch churn dash blocks separated by 2-inch wide sashing, and 2 inch wide borders. Since I wanted to get it done while my baby was still a baby , I only quilted in the white spaces of each block. I used Warm & Natural, which says that up to 10" quilting space is ok.
Now I am afraid that I made a mistake leaving the sashing & borders unquilted, since they are 42 inches long. What do you think? How does the 10 inch thing apply to long, narrow strips? And if I do need to add some more quilting, can I do it without removing the binding? Hi, and welcome to the board. The quilting suggestions mean in all directions, so 10" north-south & east-west. I would want to put some quilting in the sashing and border. How about just a square where the cornerstone would be, (where the 2 sashes intersect each other) and where the sash intersects the border. Abbie: Thanks for asking the question, always been a little unsure how the ten inch measurement applied. Hope to sww many more of your posts. You can go ahead and add some quilting even though the binding is on. We won't tell. You've done beautiful work with the quilting. I quilt these areas just because the overall look is more appealing to my eye than leaving them plain. The sashings *are* a part of the piecing design, after all. I use a narrow stencil and draw on my design, often some kind of "chain" like this these from The Stencil Company. Thank you for the suggestions! I think I will probably add some quilted "cornerstones" just to be safe. When I finally finish my next top, I am looking forward to trying more interesting quilting designs like the stencils. I did not quilt one of my borders which was 5 inches wide...totally regretted not quilting it...it makes it baggy. Good luck what ever you decide. It looks great! I think from a technical perspective your quilting is sufficient. But I also agree w/Jan...I think quilting the sashing would add visual appeal. Or even just the cornerstones. Kind of makes it a bit more visually 'cohesive'. You've done a great job on your first quilt. Keep it up! You've done a lovely job on your first quilt. Definitely add some quilting in the sashing - as Jan says, it does add to the design and will make the batting more secure. 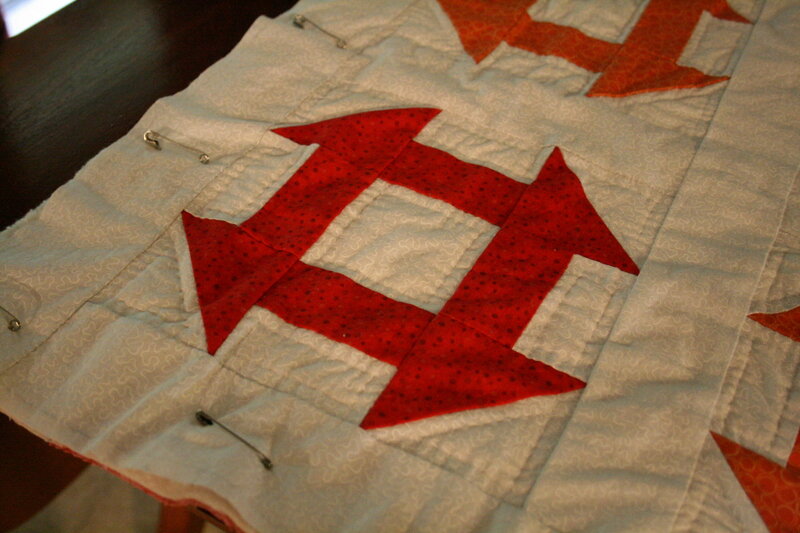 When hand quilting I have added quilting after the fact. there is no difference and the police never knew. But yes you need to add something in the sashing's. Even if it's just a line to define the space. Especially since this a baby quilt which will be laundered frequently. Those sashes and borders have to secured with quilting stitches or that batting will eventually breakdown and lump up....so as Jan has suggested use a simple stencil continuous line type design, pencil it on and the quilt, and you will be happier when you are finished. Agree that you need some quilting in those spaces. Since it is a baby quilt, put some words that have special meaning, maby name, birthdate. Or same easy shapes. Welcome to this great group. You're off to a wonderful start. Great job on your 1st quilt. You've done a great job on your first quilt. I'm in awe that you got your quilt done for your baby. I just finished the first quilt I made - it was also for my baby - She is now 42 and has 4 children of her own!! You can ALWAYS add more quilting. I got a chuckle from the "while my baby is still a baby". Some of us didn't get that done and the babies have babies. Glad to know I'm not the only one who has trouble finishing these things! My babydoll is almost 4 months old now and doesn't allow me much free time, so I've tried to keep it as simple as possible. I will definitely post a pic when I get the sashing all done. I've never really understood this concept. What would happen (to the batting) if there was no quilting in the sashings or borders? I've frequently left borders or sashings unquilted. In fact the rule would pretty much rule out any all vertical quilting (etc) and imply there always has to be some 90 degree quilting as well. Another row of quilting in the sashing would still not resolve the "in all directions" requirement, would it? What am I missing? Thanks so much for the website. I just placed an order. Welcome to this wonderful board. Lots of helpful people here. Your quilt is pretty. I no longer do hand quilting. I always do FMQ in the borders and sashes. I love doing it and love the look. I always quilt at least 3-5" apart, no matter what the batting says. I like the idea of stencils. Just be careful what you mark them with. Your quilt is so pretty and you have done a very good job with your hand quilting. I still haven't gotten the hang of rocking the needle and keeping my stitches consistent. Did you find it easy to do? Maybe I just don't stay with it long enough to get the rhythm. And the thimble is another problem for me. So I'm very impressed that you accomplished all this with your first quilt. Keep up the good work and thanks for sharing it with us. I'd like to get some thimble pads (like these: http://www.joann.com/thimblepads-12-pkg/prd12977/) for my underneath finger but I haven't tried them yet.